More about LED light bulbs? 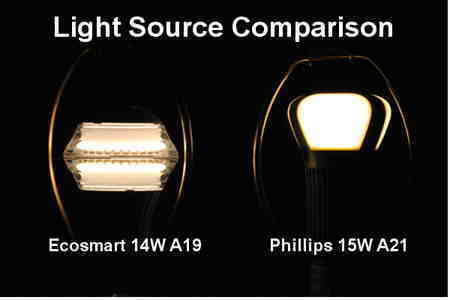 Yes, here is more about LED lamps. I mentioned in my previous article about LED Flood Lamps for Ceiling Fixtures my desire to turn pointlessly small table lamps into something useful via the latest LED Light Bulbs to replace incandescent bulbs. Of primary interest to hams is the fact one of the two brands of LED “bulbs” I am experimenting with causes a great deal of radio interference with my FM radio in the family room. Thus, I gathered my notes, grabbed a camera, found my Grundig AM, Shortwave, FM radio and began experimenting. I’m not exactly sure when this happened, but somewhere between my childhood and today, some designer thought table lamps with teeny tiny lampshades are in vogue for the American household. It seems table lamps with actual illumination utility sporting big lampshades accommodating 60, 75, 100 watt, 3-way 250 watt bulbs or multiple combinations of these bulbs gave way to merely accent lighting. The limits of puny table lamps. …obeyed the 40 watt limit, thus, turning the lamp into not much more than an obstruction light… just in case you forgot where your table is and don’t want to walk into it. …stuff a 60 or 75 watt bulb into the medium Edison socket and hope the socket doesn’t melt and the tiny lamp shade doesn’t catch fire. I was an early adopter of CFL lamps and tried a few here and there with mixed results. The smaller units fit into most lamps including the tiny models of this article. They solve the problem of wattage limits, but are physically large and fragile if you need lots of light. How many of you tried those plastic lamp frame harp extensions while trying to shoehorn a big CFL into your favorite reading lamp? Anyone… anyone? This was both clever and dumb at the same time. It was a good and noble try CFL industry, really it was, but it’s just not working out. The recent crop of LED based incandescent light bulb replacements seems to have addressed the size limit problem. 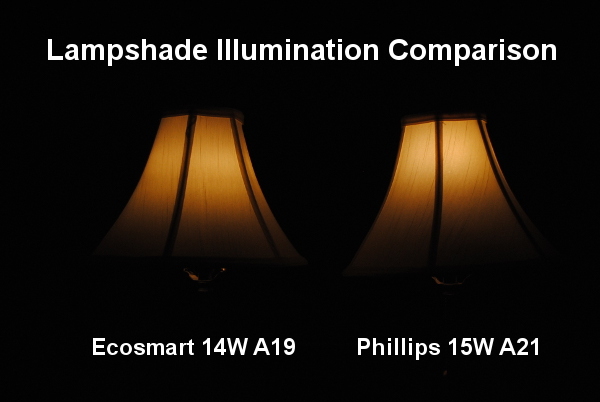 Using only 15 watts, the current offerings provide the equivalent of 60 or 75 watts incandescent illumination in a package that fits into small lampshades with little risk of burning the shade or melting the receptacle. The warm “Soft White” (aka yellowish) color is my choice for the home. The lighting industry agrees with both CFL and LED models offering lamps with this comforting color. This leaves no clear advantage for either concerning color temperature. It’s a wash. LED Light Bulb Comparison – Lighter Exposure. 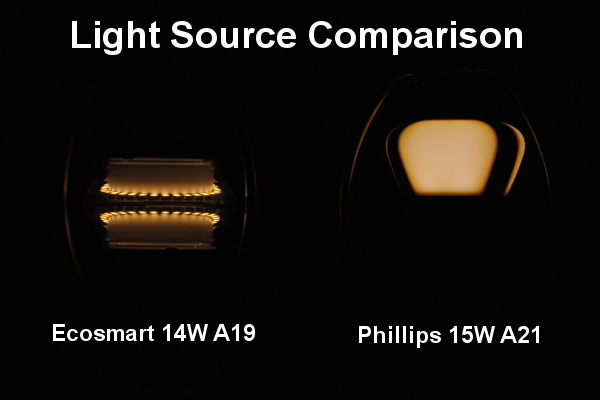 LED Light Bulb Comparison – Darker Exposure. This reduces glare a bit more to reveal more details… especially the rim of LEDs behind the focusing ring of glass in the Ecosmart model. This “LED Ring Lens” idea is what led me to purchase the Ecosmart as the Phillips “War of the Worlds” looking lamp emits light a bit higher. You can see this in the next figure showing both lamps in their small, ridiculous shades. How LED Light Bulbs illuminate small lampshades. Note, the exposure is purposely dark providing a glare free view of the light patterns. Will the LED light bulbs save the runt shades from the pit of absurdity? The Ecosmart puts light about where it should be for a small shade like this. It’s important to note, the light height won’t matter in a larger shade. At the end of the day, both models do a very good job of turning useless table lamps into useful reading lights with their potent “75 watt” illumination. LEDs, being LEDs, will, without some sort of filtering, flicker at the AC power cycle rate. My test for this was crude, but effective. I turned on a fan and observed each lamp for stroboscopic effects in the fan blades. The Ecosmart flickers. The Phillips does not flicker. If flickering lights are something that bothers you, the Ecosmart LED light is not for you. Both the Ecosmart and Phillips LED light bulbs get quite hot during operation. They have circuitry inside and that circuitry does dissipate heat. It’s warm enough to prevent holding for very long. I was surprised by this given LED efficiency and all. The Ecosmart has more of an incandescent bulb shape so traditionalists are not likely to touch the “bright” thing instinctively. The long neck of the Phillips is well below the light emitting top and gets too hot to touch. The practical point to take away from this is LED Light Bulbs need some cool down time before handling. Some things never change I suppose. I noted in another article where the Ecosmart nicely wipes out FM reception of a nearby radio. I devised a very basic test using my portable Grundig radio with an AM broadcast, shortwave and FM broadcast receiver. 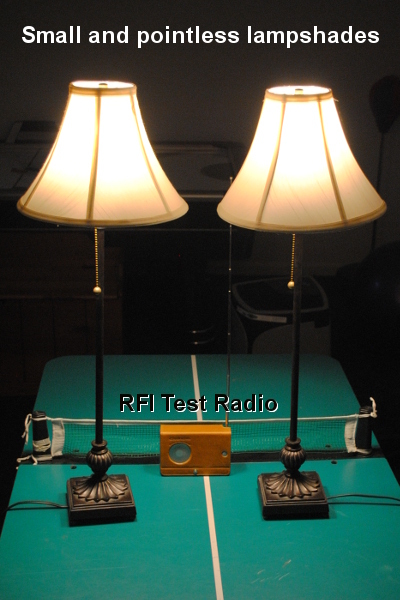 I set up a “test range” in my basement placing the radio at five foot distance intervals from the lamps. Radio for RFI testing of Ecosmart and Phillips LED lamps. I tuned the radio to a weak station for each band: AM630 WMAL, WWV 10MHz, and FM105.9 WMAL for the test. For each distance, band and lamp, I wrote what I heard while cycling the light on and off. Is this test subjective. Yes… of course it is. The end result is both models have some emissions, but the Phillips has less. Both normally reside in my family room with the FM radio. The Ecosmart wipes out FM reception. The Phillips does not. I’ve read a few reports of amateur radio operators solving noise issues by turning off their LED light bulbs. Afterwards, many swear off LED light bulbs. Hams, being hams, often purchase the cheapest make and model of anything. I suspect lower cost LED light bulbs find their way towards ham’s receivers in this way. What I’m seeing in my LED purchases is name brands seem to care more about controlling RFI from their products. Based on my observations, Phillips is “my brand” of LED light bulb and flood light. It’s a shame because I do like the Ecosmart form factor, but I’ll deal with the “war of the worlds” look if it means less RFI. The Ecosmart appears to be RFIdumb. Your mileage may vary. 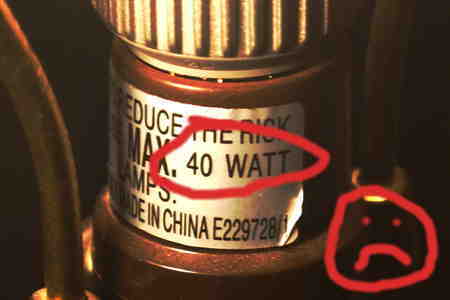 I suggest buying one bulb make/model at a time and test it thoroughly in your circumstance. Be very cautious of off brands. Well, I’m not really sure what to say about an LED article on a ham radio site. The RFI aspect is certainly important, but so is saving electricity and reading your QST by lamp light. I hope this helps someone in their next purchase of an LED replacement for an incandescent bulb. Good luck.